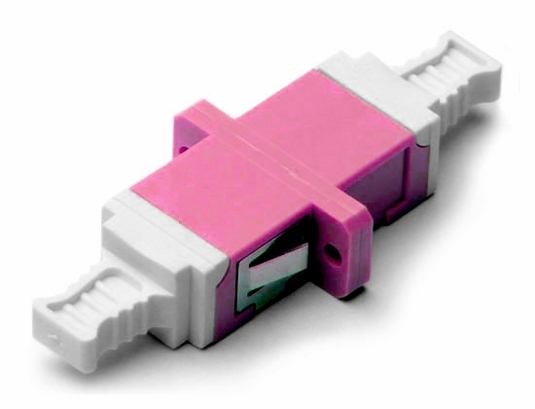 This Erika Violet OM4 LC Duplex Fiber Coupler features an SC footprint design style that allows you to use this coupler in an SC panel, which helps to double the density. Great for use in Gigabit Ethernet, multimedia and telecommunications applications. SENKO LC Adapters are available in simplex and duplex configurations. They feature self-adjusting panel latches as well as a choice of mounting orientations, and labeled polarity. Singlemode and multimode LC adapters come with a choice of zirconia ceramic or phosphor bronze split sleeves, including zirconia diagonal split sleeves for PC and APC applications.